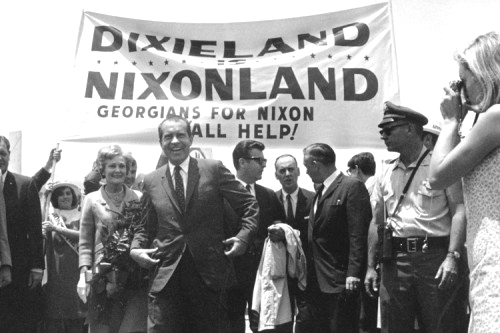 Nixon's "southern strategy" in 1968 permanently won the Segregationist vote for the Republicans. In order to diffuse criticism of the underlying racial theme of his shows, Rush Limbaugh and his imitators have often resorted to the tactic of declaring, based on whatever flimsy premise and whatever contorted argument, that the Democrats (or Blacks) are somehow the real racists. It is doubtful that anyone born in the USA is really fooled by this, but it creates enough deniability that Limbaugh's White bourgeois audience can continue listening, confidently armed with a readymade sophistic argument that the show is "not racist." Dinesh D'Souza, as an uncomprehending foreigner, takes Rush Limbaugh's and Sean Hannity's rhetoric about the Democrats being the real racists too seriously. All White people born in the United States know that this rhetoric is empty. Everybody with an ounce of sense understands that the Republican Party today is supported mainly by White people who expect the party to represent White interests, while the Democratic Party today is essentially an anti-White coalition of petulant minorities. Thus, with "The Democrats are the real racists," Dinesh D'Souza is arguing a point that, although often stated, almost every American recognizes as absurd on its face. D'Souza works especially hard to associate the Democratic Party with the Ku Klux Klan. Although the original Ku Klux Klan of the 1860s was limited to the South and counted the Republicans of that time as its enemies, the new Ku Klux Klan formed in 1915 with inspiration from D. W. Griffith's film Birth of a Nation spread over the whole of the United States and included many Republicans. By 1948 Southern Segregationists had become so disenchanted with the Democratic Party that they formed their own splinter-party, the States Rights Democratic Party, or Dixiecrats. The Dixiecrats made Strom Thurmond their presidential nominee. During the 1960s Southern Segregationists like Strom Thurmond and Jesse Helms left the Democratic Party and joined the Republican Party. Republican strategist Kevin Phillips, author of The Emerging Republican Majority, saw the opportunity and devised what became known as Nixon's southern strategy. * The realignment of Southern Segregationists with the Republican Party in the 1960s and 1970s has been a major source of Republican strength ever since. D'Souza alleges that the Democrats were somehow pro-fascist. Despite whatever cherrypicked facts D'Souza may scrape together in support of that contention, it is entirely overshadowed by the fact that FDR worked hard to drag the USA into the war against Germany and Italy (as, for example, the Almanac Singers complained in early 1941). Meanwhile Republicans like Charles Lindbergh and Senator Robert Taft sanely opposed US involvement in another European war. Donald Trump, incidentally, has taken up again the slogan of those Republicans: America First. The worst part of calling the Democrats "the real racists" is not that it is deceptive and false, but that it sacrifices White interests for the sake of winning a few partisan debating points, and teaches its audience to do the same. It keeps us inside a box, respecting the taboo that deters us from openly pursuing our racial interest. If we as White people want to have our interests effectively represented, then we must stop worrying about being called racist. Dinesh D'Souza, as an ignorant foreigner, should stop trying to meddle in the White man's politics, and preferably go back to India. "It actually had more support among Republicans than it did among Democrats!" The Democratic Party in 1965 was a very different party from what it is today. Back then it still included many segregationists, while Republican politicians of any importance were almost all outside of the former Confederacy. The Dixiecrats almost all shifted to the Republican Party in the 60s and 70s. If the same kinds of destructive changes were proposed today, the main support would be in the Democratic Party. It is rather disgusting, however, the way Republicans hide behind the pretense that the Democrats are "the real racists," etc., when they know perfectly well that the Republican Party since Nixon has been the Implicitly White Party. The danger of being only Implicitly White, of course, is that catering to White interests in the GOP has generally consisted of dog-whistles with no follow-through. Since race is never discussed openly and honestly, the question of whether White interests are being served is effectively suppressed.